Working in Boston’s music community as a bow maker since 1982, Thomas has handled bows made by the greatest makers of the 19th and 20th centuries. With a great respect for the historical traditions of making, Thomas continues to pursue his own ideas of playability and sound that a finely crafted bow can provide. 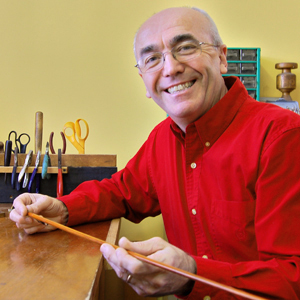 Thomas has received outstanding recognition for his work as a bow maker with seventeen awards, including gold medals from the Violin Society of America in 1986 (violin) and 1992 (cello) and the International Society of Bassists in 2003 (bass). Before studying as a bow maker, Thomas was a professional bassist and graduated from Berklee College of Music.